For temperature changes on other time scales, see Global temperature record. Global mean surface temperature change from 1880 to 2017, relative to the 1951–1980 mean. The 1951–1980 mean is 14.2 °C (57.6 °F). The black line is the global annual mean and the red line is the five-year lowess smooth. The blue uncertainty bars show a 95% confidence limit. Source: NASA GISS. Watch how summer temperatures in the Northern Hemisphere change from 1955 to 2011. "Hot" (orange), "very hot" (red) "extremely hot" (brown) "average" (white), unusually "cold" (light blue), "very cold" (dark blue) and "extremely cold" (purple). The instrumental temperature record provides the temperature of Earth's climate system from the historical network of in situ measurements of surface air temperatures and ocean surface temperatures. Data are collected at thousands of meteorological stations, buoys and ships around the globe. The longest-running temperature record is the Central England temperature data series, which starts in 1659. The longest-running quasi-global record starts in 1850. In recent decades more extensive sampling of ocean temperatures at various depths have begun allowing estimates of ocean heat content but these do not form part of the global surface temperature datasets. The global average and combined land and ocean surface temperature, show a warming of 0.85 [0.65 to 1.06] °C, in the period 1880 to 2012, based on multiple independently produced datasets. This gives a trend of 0.064 ± 0.015 °C per decade over that period. The trend is faster for land than ocean, faster for Arctic regions, and faster since the 1970s than the longer period. Most of the observed warming occurred in two periods: around 1900 to around 1940 and around 1970 onwards; the cooling/plateau from 1940 to 1970 has been mostly attributed to sulphate aerosol. Some of the temperature variations over this time period may also be due to ocean circulation patterns. Attribution of the temperature change to natural or anthropogenic (i.e., human-induced) factors is an important question: see global warming and attribution of recent climate change. Land air temperatures are rising faster than sea surface temperatures. Over 1979 to 2012 the trend for land was about 0.254 ± 0.050 °C per decade per CruTemp4 or 0.273 ± 0.047 per GHCN while the trend for sea surface temperatures is about 0.072 ± 0.024 °C per decade per HadISST to 0.124 ± 0.030 °C per decade per HadSST3. For 1979 to 2012, the linear warming trend for combined land and sea temperatures has been 0.155 °C (0.122 to 0.188 °C) per decade, according to AR5. Uncertainties in the temperature record, e.g., the urban heat island effect, are discussed further in a later section. In January 2017, several scientific agencies around the world, including NASA and the NOAA in the United States and the Met Office in the United Kingdom, named 2016 the warmest year recorded. This marked the third consecutive year reaching a new record temperature, the first time since the current warming trend began in the 1970s that three years in a row were record highs. 2016's record meant that 16 of the 17 warmest years have occurred since 2000, 2017 being the third-hottest year on record meant that 17 of the last 18 warmest years have occurred since 2000. While record-breaking years can attract considerable public interest, individual years are less significant than the overall trend. Some climatologists have criticized the attention that the popular press gives to "warmest year" statistics; for example, Gavin Schmidt stated "the long-term trends or the expected sequence of records are far more important than whether any single year is a record or not." Of the 2015 and 2016 records, Schmidt stated that the 2014–16 El Niño event was "a factor ... but both 2015 and 2016 would have been records even without it"; he attributed about 90% of the warming in 2016 to anthropogenic climate change. Consistent with Schmidt's comment, the NASA / NOAA announcement stated that "globally-averaged temperatures in 2016 were 1.78 degrees Fahrenheit (0.99 degrees Celsius) warmer than the mid-20th century mean" and that the impact of El Niño warming was estimated to have "increased the annual global temperature anomaly for 2016 by 0.2 degrees Fahrenheit (0.12 degrees Celsius)." Comments from climate scientists reported in The Washington Post showed strong agreement in attributing the warming primarily to anthropogenic climate change, with some contribution from El Niño warming, though there were differing views on the significance of individual records. Deke Arndt leads the monitoring group at NOAA's National Centers for Environmental Information and offered an analogy in a report on NPR: "The long-term warming is a lot like riding up an escalator over time. The longer you're on the escalator, the higher you go. And the El Niño phenomenon is like jumping up and down while you're on the escalator." Arndt also stated that the "long-term warming is driven almost entirely by greenhouse gases." Peter Stott, acting director of the Met Office, noted the influence of the El Niño event on 2016 temperatures but also stated that "the main contributor to warming over the last 150 years is human influence on climate from increasing greenhouse gases in the atmosphere." Tim Osborn, Director of Research at the University of East Anglia's Climatic Research Unit, agreed stating that "[m]ultiple lines of independent evidence confirm that the planet has warmed over the last 150 years: warmer oceans, warmer land, warmer lower atmosphere and melting ice. This long-term trend is the main cause for the record warmth of 2015 and 2016, surpassing all previous years—even ones with strong El Niño events." Based on the NOAA dataset (note that other datasets produce different rankings), the following table lists the global combined land and ocean annually averaged temperature rank and anomaly for each of the 10 warmest years on record. Although the NCDC temperature record begins in 1880, reconstructions of earlier temperatures based on climate proxies, suggest these years may be the warmest for several centuries to millennia, or longer. Global temperature change — decadal averages, 1880s–2000s (NOAA). Numerous cycles have been found to influence annual global mean temperatures. The tropical El Niño–La Niña cycle and the pacific decadal oscillation are the most well-known of these cycles. An examination of the average global temperature changes by decades reveals continuing climate change, and AR5 reports "Each of the last three decades has been successively warmer at the Earth's surface than any preceding decade since 1850 (see Figure SPM.1). In the Northern Hemisphere, 1983–2012 was likely the warmest 30-year period of the last 1,400 years (medium confidence)". The following chart is from NASA data of combined land-surface air and sea-surface water temperature anomalies. Greenhouse gases trap outgoing radiation warming the atmosphere which in turn warms the land. El Niño generally tends to increase global temperatures. La Niña, on the other hand, usually causes years which are cooler than the short-term average. El Niño is the warm phase of the El Niño–Southern Oscillation (ENSO) and La Niña the cold phase. Aerosols diffuse incoming radiation generally cooling the planet. Volcanoes are the largest source but there are also anthropogenic sources. There are several other effects such as clouds. Some aerosols like carbon black have warming effects. Land use change like deforestation can increase greenhouse gases through burning biomass. Albedo can also be changed. Incoming solar radiation varies very slightly, with the main variation controlled by the approximately 11-year solar magnetic activity cycle. Records of global average surface temperature are usually presented as anomalies rather than as absolute temperatures. A temperature anomaly is measured against a reference value or long-term average. For example, if the reference value is 15 °C, and the measured temperature is 17 °C, then the temperature anomaly is +2 °C (i.e., 17 °C −15 °C). Temperature anomalies are useful for deriving average surface temperatures because they tend to be highly correlated over large distances (of the order of 1000 km). In other words, anomalies are representative of temperature changes over large areas and distances. By comparison, absolute temperatures vary markedly over even short distances. The Earth's average surface absolute temperature for the 1961–1990 period has been derived by spatial interpolation of average observed near-surface air temperatures from over the land, oceans and sea ice regions, with a best estimate of 14 °C (57.2 °F). The estimate is uncertain, but probably lies within 0.5 °C of the true value. Given the difference in uncertainties between this absolute value and any annual anomaly, it's not valid to add them together to imply a precise absolute value for a specific year. The temperature data for the record come from measurements from land stations and ships. On land, temperature sensors are kept in a Stevenson screen or a maximum minimum temperature system (MMTS). The sea record consists of surface ships taking sea temperature measurements from engine inlets or buckets. The land and marine records can be compared. Land and sea measurement and instrument calibration is the responsibility of national meteorological services. Standardization of methods is organized through the World Meteorological Organization (and formerly through its predecessor, the International Meteorological Organization). Most meteorological observations are taken for use in weather forecasts. Centers such as ECMWF show instantaneous map of their coverage; or the Hadley Centre show the coverage for the average of the year 2000. Coverage for earlier in the 20th and 19th centuries would be significantly less. While temperature changes vary both in size and direction from one location to another, the numbers from different locations are combined to produce an estimate of a global average change. There is a scientific consensus that climate is changing and that greenhouse gases emitted by human activities are the primary driver. The scientific consensus is reflected, for example, by the Intergovernmental Panel on Climate Change (IPCC), an international body which summarizes existing science, and the U.S. Global Change Research Program. The methods used to derive the principal estimates of global surface temperature trends—HadCRUT3, NOAA and NASA/GISS—are largely independent. This graph shows how short-term variations occur in the global temperature record. However, the graph still shows a long-term trend of global warming. Image source: NCADAC. The preliminary results of an assessment carried out by the Berkeley Earth Surface Temperature group and made public in October 2011, found that over the past 50 years the land surface warmed by 0.911 °C, and their results mirrors those obtained from earlier studies carried out by the NOAA, the Hadley Centre and NASA's GISS. The study addressed concerns raised by "skeptics" including urban heat island effect, "poor" station quality, and the "issue of data selection bias" and found that these effects did not bias the results obtained from these earlier studies. One of the issues that has been raised in the media is the view that global warming "stopped in 1998". This view ignores the presence of internal climate variability. Internal climate variability is a result of complex interactions between components of the climate system, such as the coupling between the atmosphere and ocean. An example of internal climate variability is the El Niño–Southern Oscillation (ENSO). The El Niño in 1998 was particularly strong, possibly one of the strongest of the 20th century. Cooling between 2006 and 2008, for instance, was likely driven by La Niña, the opposite of El Niño conditions. The area of cooler-than-average sea surface temperatures that defines La Niña conditions can push global temperatures downward, if the phenomenon is strong enough. Even accounting for the presence of internal climate variability, recent years rank among the warmest on record. For example, every year of the 2000s was warmer than the 1990 average. Temperature trends from 1901 are positive over most of the world's surface except for Atlantic Ocean south of Greenland, the southeastern United States, and parts of Bolivia. Warming is strongest over inland areas in Asia and North America as well as south-eastern Brazil and some areas in the South Atlantic and Indian oceans. Since 1979 temperature increase is considerably stronger over land while cooling has been observed over some oceanic regions in the Pacific Ocean and Southern Hemisphere; the spatial pattern of ocean temperature trend in those regions is possibly related to the pacific decadal oscillation and Southern Annular Mode. Seasonal temperature trends are positive over most of the globe but weak cooling is observed over the mid latitudes of the southern ocean but also over eastern Canada in spring because of strengthening of the North Atlantic oscillation. Warming is stronger over northern Europe, China and North America in winter, Europe and Asia interior in spring, Europe and north Africa in summer and northern North America, Greenland and eastern Asia in autumn. Enhanced warming over north Eurasia is partly linked to the Northern Annular Mode, while in the southern hemisphere the trend toward stronger westerlies over the Southern ocean favoured a cooling over much of Antarctica with the exception of the Antarctic Peninsula where strong westerlies decrease cold air outbreaks from the south. The Antarctic Peninsula has warmed by 2.5 °C (4.5 °F) in the past five decades at Bellingshausen Station. Comparison of ground-based (blue) and satellite-based (red: University of Alabama in Huntsville; green: RSS) records of global surface temperature change from 1979–2009. Linear trends plotted since 1982. The most recent climate model simulations give a range of results for changes in global-average temperature. Some models show more warming in the troposphere than at the surface, while a slightly smaller number of simulations show the opposite behaviour. There is no fundamental inconsistency among these model results and observations at the global scale. The satellite records used to show much smaller warming trends for the troposphere which were considered to disagree with model prediction; however, following revisions to the satellite records, the trends are now similar. The IPCC fifth assessment report concluded "assessment of the large body of studies comparing various long-term radiosonde and MSU products since AR4 is hampered by data set version changes, and inherent data uncertainties. These factors substantially limit the ability to draw robust and consistent inferences from such studies about the true long-term trends or the value of different data products". The U.S. National Weather Service Cooperative Observer Program has established minimum standards regarding the instrumentation, siting, and reporting of surface temperature stations. The observing systems available are able to detect year-to-year temperature variations such as those caused by El Niño or volcanic eruptions. The urban heat island effect is very small, estimated to account for less than 7002273152000000000♠0.002 °C of warming per decade since 1900. Brooks investigated Historical Climate Network (USHCN) sites in Indiana in 2005, and assigned 16% of the sites an 'excellent' rating, 59% a 'good' rating, 12.5% a 'fair' rating, and 12.5% 'poor' rating. A 2006 study analyzed 366 U.S. surface stations; results indicate relatively few significant temperature trends, and these are generally evenly divided between warming and cooling trends. 95% of the stations displayed a warming trend after land use/land cover changes took place, and the authors noted "this does not necessarily imply that the changes are the causative factor." Another study that same year documented examples of well and poorly sited monitoring stations in the United States, including ones near buildings, roadways, and air conditioning exhausts. Another study concluded in 2006, that existing empirical techniques for validating the local and regional consistency of temperature data are adequate to identify and remove biases from station records, and that such corrections allow information about long-term trends to be preserved. A study in 2013 also found that urban bias can be accounted for, and when all available station data is divided into rural and urban, that both temperature sets are broadly consistent. Map of the land-based long-term monitoring stations included in the Global Historical Climatology Network. Colors indicate the length of the temperature record available at each site. National Oceanic and Atmospheric Administration (NOAA) maintains the Global Historical Climatology Network (GHCN-Monthly) data base containing historical temperature, precipitation, and pressure data for thousands of land stations worldwide. Also, NOAA's National Climatic Data Center (NCDC) of surface temperature measurements maintains a global temperature record since 1880. NASA's Goddard Institute for Space Studies maintains GISTEMP. More recently the Berkeley Earth Surface Temperature dataset. These datasets are updated frequently, and are generally in close agreement. ^ [WGI AR5 Full Report PDF, p.5 "Climate Change 2013: The Physical Science Basis, IPCC Fifth Assessment Report (WGI AR5)"] Check |url= value (help). IPCC AR5. 2013. ^ Swanson, K.L. ; Sugihara, G.; Tsonis, A.A. (22 September 2009). "Long-term natural variability and 20th century climate change". Proc. Natl. Acad. Sci. U.S.A. 106 (38): 16120–3. Bibcode:2009PNAS..10616120S. doi:10.1073/pnas.0908699106. PMC 2752544. PMID 19805268. ^ a b Potter, Sean; Cabbage, Michael; McCarthy, Leslie (January 19, 2017). "NASA, NOAA Data Show 2016 Warmest Year on Record Globally" (Press release). NASA. Retrieved January 20, 2017. ^ a b c "Earth Sets a Temperature Record for the Third Straight Year". the New York Times. 18 January 2017. Retrieved 19 January 2017. ^ a b c "2016: one of the warmest two years on record" (Press release). Met Office of the United Kingodom. January 18, 2017. Retrieved January 20, 2017. 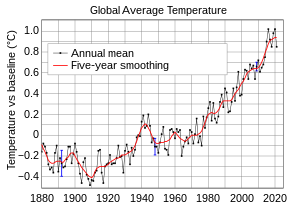 ^ a b "Climate change: Data shows 2016 likely to be warmest year yet". BBC News Online. 18 January 2017. Retrieved 19 January 2017. ^ Schmidt, Gavin (22 January 2015). "Thoughts on 2014 and ongoing temperature trends". RealClimate. Retrieved 4 September 2015. ^ Carrington, Damian (January 19, 2017). "2016 hottest year ever recorded – and scientists say human activity to blame". The Guardian. Retrieved January 20, 2017. ^ Samenow, Jason (January 18, 2017). "Scientists react to Earth's warmest year: 'We are heading into a new unknown'". The Washington Post. Retrieved January 20, 2017. ^ Brumfiel, Geoff (January 18, 2017). "U.S. Report Confirms 2016 Was The Hottest Year On Record". NPR. Retrieved January 20, 2017. ^ Greenfield-Boyce, Nell (January 18, 2017). "2016 Was The Hottest Year Yet, Scientists Declare". NPR. Retrieved January 20, 2017. ^ "Tim Osborn to take over leadership of CRU" (Press release). University of East Anglia. 21 December 2016. Retrieved 20 January 2017. ^ "Global Climate Report – Annual 2017". NOAA. Retrieved 18 January 2018. ^ "NOAA National Climatic Data Center, State of the Climate: Global Analysis for Annual 2014". NOAA. Retrieved 2015-01-21. ^ Hansen, J.E. (20 November 2012). "Data.GISS: GISS Surface Temperature Analysis (GISTEMP)". New York, NY, USA: NASA GISS. . Website curator: Schmunk, R.B. ^ a b Jones PD, New M, Parker DE, Martin S, Rigor IG (1999). "Surface air temperature and its changes over the past 150 years". Reviews of Geophysics. 37 (2): 173–199. Bibcode:1999RvGeo..37..173J. doi:10.1029/1999RG900002. ^ Guide to the Global Observing System (PDF). WMO. 2007. ISBN 978-9263134882. ^ "Understanding and Responding to Climate Change – Highlights of National Academies Reports" (PDF). United States National Academies. 2005. Archived from the original (PDF) on 2007-06-11. Retrieved 2007-07-13. ^ a b c d "Cooling the Warming Debate: Major New Analysis Confirms That Global Warming Is Real". Science Daily. 2011-10-21. Retrieved 2011-10-22. ^ see also: PBS (January 10, 2007). "Interviews – James Hansen: Hot Politics: FRONTLINE: PBS". PBS . "(...) The 1990s is the real appearance of the science skeptics. How much did they come after you? I actually don't like the word "skeptics" for them; I think it's better to call them "contrarians," because skepticism is part of science; all scientists are skeptics (...)"
^ Ian Sample (2011-10-20). "Global warming study finds no grounds for climate sceptics' concerns". The Guardian. Retrieved 2011-10-22. ^ Richard Black (2011-10-21). "Global warming 'confirmed' by independent study". BBC News. Retrieved 2011-10-21. ^ "Climate change: The heat is on". The Economist. 2011-10-22. Retrieved 2011-10-22. ^ "IPCC Fourth Assessment Report, Chapter 3" (PDF). 2007-02-05. pp. 250–1. Retrieved 2009-03-14. ^ Polyakov, I.V. ; Bekryaev, R.V. ; Bhatt, U.S.; Colony, R.L. ; Maskshtas, A.P. ; Walsh, D.; Bekryaev, R.V. ; Alekseev, G.V. (2003). "Variability and trends of air temperature in the Maritime Arctic". J. Clim. 16 (12): 2067–77. Bibcode:2003JCli...16.2067P. doi:10.1175/1520-0442(2003)016<2067:VATOAT>2.0.CO;2. ^ Liu, J.P.; Curry, J.A. ; Da, Y.J. ; Horton, Radley (2007). "Causes of the northern high-latitude land surface winter climate change". Geophys. Res. Lett. 34 (14): L14702. Bibcode:2007GeoRL..3414702L. doi:10.1029/2007GL030196. ^ David W. J. Thompson; Susan Solomon (2002). "Interpretation of Recent Southern Hemisphere Climate Change" (PDF). Science. 296 (5569): 895–9. Bibcode:2002Sci...296..895T. doi:10.1126/science.1069270. PMID 11988571. Archived from the original (PDF) on 2011-08-11. ^ "Antarctic temperature data – Monthly mean surface temperature data and derived statistics for some Antarctic stations". British Antarctic Survey. Retrieved 2007-07-13. ^ Trends in the Lower Atmosphere: Steps for Understanding and Reconciling Differences. Archived 2007-02-03 at the Wayback Machine Thomas R. Karl, Susan J. Hassol, Christopher D. Miller, and William L. Murray, editors, 2006. A Report by the Climate Change Science Program and the Subcommittee on Global Change Research, Washington, DC. ^ Trenberth et al., Ch. 3, Observations: Atmospheric Surface and Climate Change, Section 3.2.2.2: Urban Heat Islands and Land Use Effects, p. 244, in IPCC AR4 WG1 2007. ^ Hale, R.C. ; Gallo, K.P. ; Owen, T.W. ; Loveland, T.R. (June 2006). "Land use/land cover change effects on temperature trends at U.S. Climate Normals stations". Geophys. Res. Lett. 33 (11): L11703. Bibcode:2006GeoRL..3311703H. doi:10.1029/2006GL026358. ^ Mahmood R, Foster SA, Logan D (2006). "The GeoProfile metadata, exposure of instruments, and measurement bias in climatic record revisited". International Journal of Climatology. 26 (8): 1091–1124. Bibcode:2006IJCli..26.1091M. doi:10.1002/joc.1298. ^ Peterson, Thomas C. (August 2006). "Examination of potential biases in air temperature caused by poor station locations". Bull. Amer. Meteor. Soc. 87 (8): 1073–89. Bibcode:2006BAMS...87.1073P. doi:10.1175/BAMS-87-8-1073. ^ "GHCN-Monthly Version 2". NOAA. Retrieved 2007-07-13. ^ "Global Surface Temperature Anomalies". National Climatic Data Center. Retrieved 2010-06-16.